Kim Esbensen and Claas Wagner have gold on their minds. However, only to explain that “Sampling—is not gambling!”: the American “Gold Rush” of the late 19th Century is a good metaphor for the unrepresentative nature of grab sampling: something that you will soon realise is to be avoided in any sampling regime. Kim Esbensen and Claas Wagner continue their study of “Heterogeneity—the root of all evil” in the Sampling Column. We would be most interested to hear readers’ views on our new column. Representative sampling is essential for most analyses to be relevant, and the column will move from its early theoretical introduction to practical solutions. Readers interested in learning more about the Theory of Sampling may be interested in the Proceedings of the 7th World Conference on Sampling and Blending which are now freely available at http://www.impublications.com/wcsb7. In the new Sampling Column, Kim Esbensen and Claas Wagner tell us about hetergeneity and why it is everywhere and should always be considered when sampling. The next issue will see a second part looking at how to avoid the errors involved in sampling heterogeneous materials—and that is all of them! 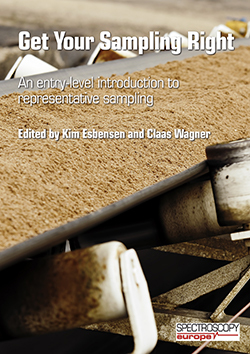 This is a new column on Sampling, edited by Kim Esbensen and Claas Wagner. I really only became aware of the Theory of Sampling (TOS) following conversations with Kim at the NIR-2013 conference in La Grande Motte, near Montpellier, France. I won’t steal Kim and Claas’ thunder by going into detail, but I see this new column as a perfect complement to our others. Ian Michael, editor.